Iyengar yoga is quite simply, pure yoga. It is a style of yoga devised by Mr B K S Iyengar who lives in Pune, India and is one of the world’s most respected experts on yoga. There are hundreds of Iyengar yoga training centers around the world training students in his way of practising. His method of teaching is renowned for its accuracy, precision and attention to detail. 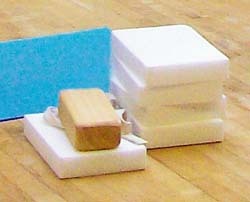 The Iyengar style of teaching is known for the use of equipment i.e. blocks, bricks, belts, chairs, bolsters etc. which makes this precision possible. These aids enable everyone to be accurate in their alignment at all times and each pose can be performed with absolute safety. This allows the practice of yoga to be available for everyone whatever their age, fitness or experience. However what makes Iyengar yoga so exciting is this emphasis on precision which creates more awareness, eventually of every cell of the body. With this awareness it is possible to feel where there are any blockages to the flow of energy and how to stimulate these areas back to being energised and active again. The Iyengar method of practice creates an amazing sensitivity to the mind, the body and eventually the spirit. Without the accuracy in the practice of yoga, this sensitivity is often missed and it is the wonderful connection with the body which makes the postures a joy to perform. An Iyengar teacher will be able to guide you on your journey in finding this joy. An Iyengar teacher has to go through rigorous training spread over a number of years and has to pass strict examinations to become qualified to teach yoga. It is important to know that your teacher is fully qualified and the Iyengar title guarantees this. It is important that the yoga class you choose gives you the benefits you deserve. An Iyengar class will include instructions on how to perform the postures, how to use the equipment, guidance with deep breathing (pranayama) and the practice of relaxation. Attending an Iyengar class also gives you the knowledge that you will have an experienced teacher who will be able to help and adjust when necessary. The most obvious benefits that people notice after attending a class are the physical changes: an increase in suppleness, more stamina and added strength. This of course is brilliant but there are also many subtle changes which can occur. The concentration and focus needed during the postures brings greater body awareness, not only of the external body but also how the internal body functions. Also there is often a feeling of being more calm, having the ability to deal with the challenges of life more easily and gaining a greater sense of confidence. The benefits of yoga are numerous and vary with each individual. The best way to find out how yoga can help you is to experience it for yourself! It is always a good idea to contact your local teacher first to find out more details about the class you wish to attend and for the teacher to get to know you. It is important to describe any problems you may have before attending the class so that your teacher can give you all the attention you require.